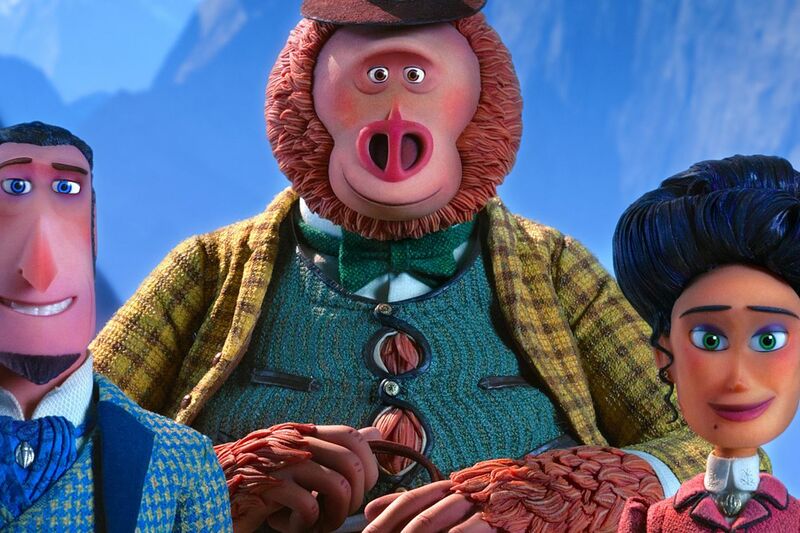 Laika, the animation studio behind such quirky fare as Coraline and The Boxtrolls, takes a turn toward the mainstream with Missing Link, resulting in pleasant but forgettable results. When that fails, he gets a tip about the whereabouts of the Sasquatch in the Pacific Northwest, and off he goes, making contact with the creature and getting rather less than he bargained for — the audience might end up feeling the same way. The wrinkle here is that Bigfoot is a gentle giant (shades of Harry and the Hendersons). He’s literate and articulate (the nonthreatening voice of Zach Galifianakis), afraid of humans, and above all lonely. He’s so polite and formal that Sir Lionel refers to him as Mr. Link. He’s also the last of his kind and wants to persuade Sir Lionel to take him to the Himalayas, where he hopes his distant relatives, the yeti, will take him in. This is agreeable to Sir Lionel, who thinks he’ll get two amazing discoveries for the price of one, provided he can secure a map to the secret entrance of Shangri-La from his unhappy ex girlfriend Adelina (Zoe Saldana). The story feels like something borrowed from a more conventional piece of studio storytelling — it’s frantic and busy and not terribly involving. The animation is also uneven — the vistas and backgrounds are beautifully done, but the characters themselves are not. Mr. Link, as he is called, is narrow-shouldered, spindly-armed, and potbellied, with orange fur that’s layered like feathers, except for his exposed face, a jumble of mismatched primate features. It’s as though somebody had a misadventure with Mr. Potato Head. The human characters are plastic and inexpressive, and Adelina has harsh edges to match her personality — her facial expressions range from slightly angry to very angry. The movie is a travelogue, though, and as it moves from the Pacific Northwest to London and finally to the Himalayas, it has enough eye candy to keep viewers interested. The story ultimately settles down just enough to allow for some effective emotional beats — self-aggrandizing Sir Lionel sets aside his own selfish goals in order to serve the interest of his new friend Mr. Link. The creature’s journey to the land of the yeti (led by Emma Thompson) also takes an unexpected turn, a welcome bit of inventiveness in a mostly predictable adventure. The Missing Link. Directed by Chris Butler. Featuring the voices of Hugh Jackman, Zach Galifianakis, Zoe Saldana and Emma Thompson. Distributed by Annapurna.